WASHINGTON — Seven states, from Nebraska to Massachusetts, will soon build enough wind turbines to more than double their capacity to generate clean and reliable wind energy, according to the American Wind Energy Association (AWEA) U.S. Wind Industry Third Quarter 2018 Market Report released today. The report also reveals the first firm orders for 4-megawatt (MW) land-based wind turbines, nearly twice as powerful as the average wind turbine installed in 2017 . . . The average utility-scale wind turbine installed in 2017 was rated at 2.32 MW but more powerful wind turbines are on the horizon, according to AWEA. In the third quarter, new orders for wind turbines include land-based turbines above 4 MW for the first time, which are capable of powering 1,400 homes a year. Read more here. 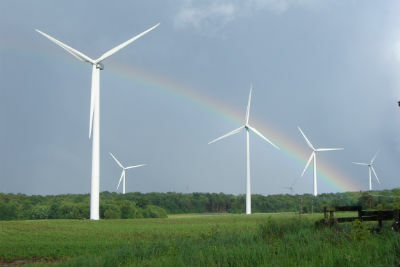 This entry was posted in Nebraska / Midwest News, NewsBlog and tagged American Wind Energy Association (AWEA), Nebraska Energy Office, U.S. Wind Industry Third Quarter 2018 Market, Wind Energy Generation in Nebraska, wind energy projects under development in Nebraska on October 30, 2018 by Helen Deffenbacher.